Do you think rain would really keep Fela from performing? The outspoken Nigerian musician would never miss a chance to be heard. When a dreary day washed out hopes of the cast of Fela! providing a free concert at Brooklyn Bridge Park Monday night, the cast and band quickly moved the location to the nearby St. Ann’s Warehouse. The rain didn’t inhibit fans either, who had the venue nearly packed when the doors opened at 6 p.m. for the 6:30 p.m. show. The concert commenced 15 minutes late and was preceded by four speakers—two artistic directors and two politicians. (Forgive me for not remembering their names. No one in the house was too concerned with them.) After an anxious crowd failed to hide its disinterest with the speakers, the Fela! band took the stage. After playing a 10 to 15-minute intro (which should have been shortened), Sahr Ngaujah (and his abs) took the stage, followed by five of his Queens. Ngaujah spiritedly chatted with the crowd about hurried lives and following dreams, as he guided his band through “Trouble Sleep,” “Ego,” and other Kuti tunes. Were you at the free Fela! concert, Rushers? 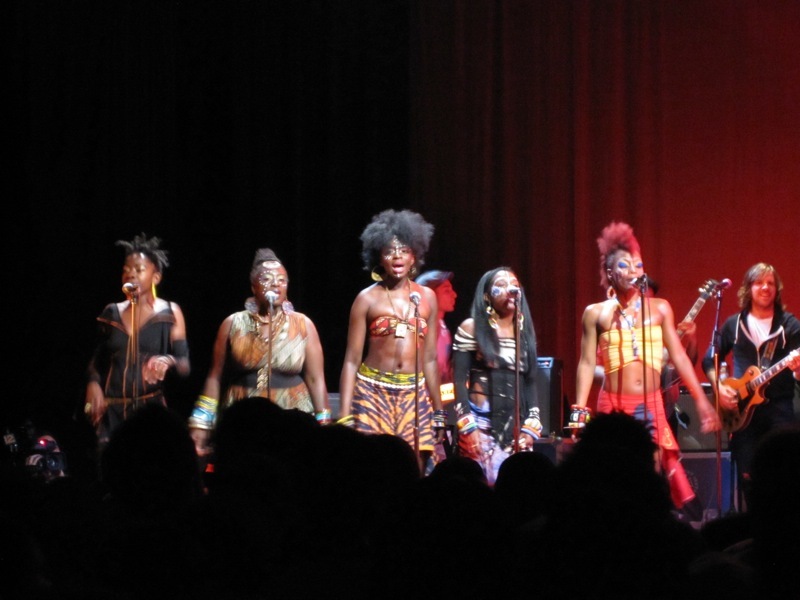 What did you think of Ngaujah’s performance and the set list? Leave your thoughts on the concert in the comments below! Don’t forget to follow Stage Rush on Twitter and Facebook for on-the-go updates, news, and sightings! I love this performance on video! Although, I have to admit, I don’t know a word he’s singing. The rhythm is great. @Liz: Liz, I can’t understand a word he’s singing either. It’s one of my problems I have with the show.